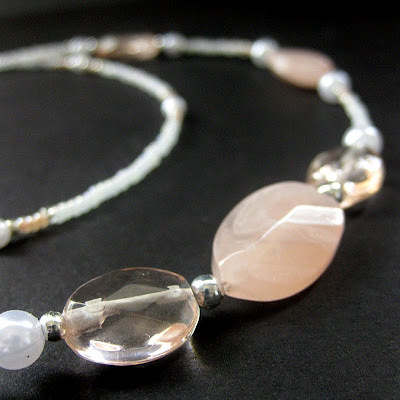 Shimmering beads in shades of soft pink are joined with a hint of silver for an eyeglass chain reminiscent of mornings spent lazing in the soft light of dawn. If you're like me, finding your reading glasses when you need them can often be a timely activity. You can solve that problem by wearing an eyeglass chain that hooks to the arms of your glasses and lets them dangle securely (and in our case, decoratively!) around your neck. The strand is made with smooth beads at the nape for the comfort of the wearer and decorative beads at the ends to show off a sense of style while keeping eyeglasses easily in reach.